If you're looking for a great pet urine cleaner and you live in Tampa FL then we have the solution for you. 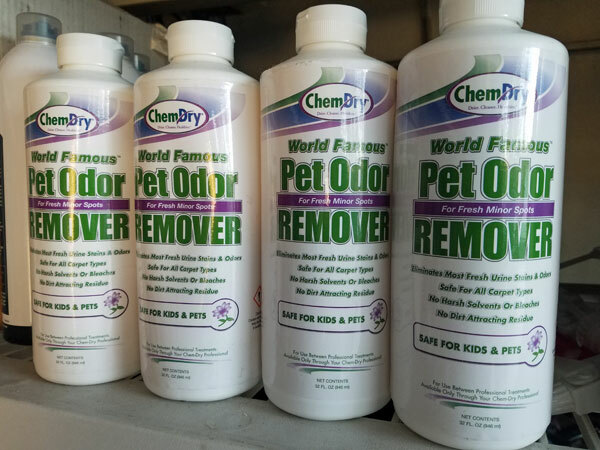 Chem-Dry's World Famous Pet Odor Remover is the best pet urine cleaner on the market and you can have it delivered to your home by a professional carpet cleaning technician. Chem-Dry of Tampa FL carries The World Famous Pet Odor Remover on our trucks. Call us and order two bottles of the amazing pet urine cleaner and we will deliver it directly to your home if you live in the Tampa FL area. This pet urine cleaner is safe non toxic pet odor eliminator that easily knocks out pet stains before they have a chance to develop into full blown problems. It's as easy as 1,2,3. Just pour this cleaner on a wet urine stain and blot up the extra solution. Then place a dry towel over the spot for 24 hours. Then remove the towel and let air dry the rest of the way. There's no smell or yellow stain once dries. I've used this product in my own home for years and works flawlessly. Every time there is a pet accident in our home we use the World Famous pet Odor Remove and then we go about our business. Time and time again this pet urine cleaner comes through for us. We believe so much in this product that we guarantee it will work for you or call us and we will refund your money. It's that good. For the best pet urine cleaner in Tampa FL call Chem-Dry of Tampa.